Netflix dropped a new season of The Punisher onto its servers this weekend, reintroducing streaming fans to the world of uber-violent veteran vigilante Frank Castle. If recent history is any indication, that suggests the service is already hard at work cooking up an exciting follow-up project for the show’s second season, i.e., the politely worded notice it’ll likely be dropping in a few weeks, announcing that the series has been abruptly canceled, just like most of its fellow Netflix Marvel shows. 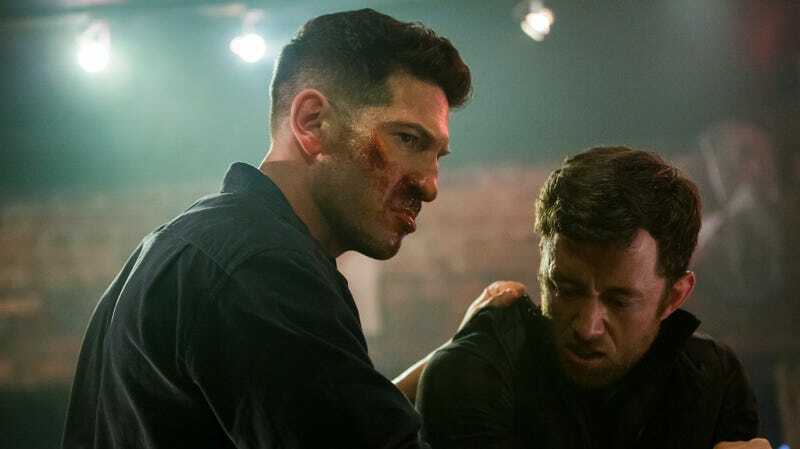 But if The Punisher is destined to go the way of Iron Fist, Luke Cage, and Daredevil—all of which the service dropped last year, regardless of the popularity of their latest outings—then star Jon Bernthal is ready to accept it with distinctly un-Frank-like sangfroid. Bernthal gave an interview with Variety this week, ahead of the new episodes, detailing the multiple injuries he heroically suffered while filming the new season, and also how he prepares for the hurts that gauze, cauterization, and steely grimaces can’t fix, a.k.a. the ones inflicted as a result of whatever licensing maneuvering is going down between Netflix and Disney right now. Please consider this your regular reminder to just relax, let go, and let god, courtesy of The Punisher, a show about a man who puts a big skull on his chest to make it extra scary when he shoots criminals in the head.